The Chard 30qt. 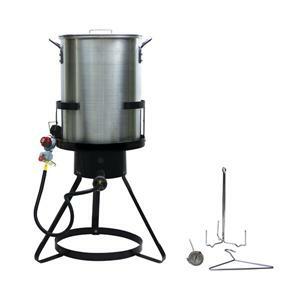 Outdoor Cooker Kit comes with everything you need to begin your outdoor cooking experience! You can fry, boil, steam.even brew. Featuring a durable, large capacity 30-quart aluminum cooking pot with a powerful 50,000 BTU cast iron burner and stable 3-legged base, this model also includes a CSA-approved regulator and auto shut-off safety timer. The unit also comes with a handy spigot and cover, poultry stand, safety hanger and 12" thermometer. Whether you are cooking the Sunday family dinner or the Thanksgiving main event, the Chard 30qt. Outdoor Cooker gives you the right tools to make it yours! Cast iron & Aluminum. Black/Aluminum.